As Alaskans, we are already experiencing the effects of climate change. The Arctic is warming at twice the rate of the rest of the planet. Sea ice loss, increased temperatures, ocean acidification and changing habitats are forcing many of our communities to cope in new ways. Some villages are facing the massive costs of having to move due to coastal erosion. Anthropologists are scurrying to survey and retrieve artifacts before they vanish into the rising ocean. Fish runs are diminishing and in some areas the permafrost is melting and threatening foundations of buildings and homes. The decline of sea ice has pushed polar bears to spend more time on land and forced us to prepare for increased human-bear conflicts. Some wildlife species are adjusting while many are in peril. The changes in temperature affect human subsistence users and our availability of wildlife foods. Ultimately, these changes threaten the ecosystems that underpin life on Earth. It is essential that we pay attention to the realities of our times. Earth is supported by complex, nested, local and global systems. What we put into the air falls in the rain and what we put on the Earth washes into our rivers and oceans. Chemicals sprayed on strawberries end up in our children's bodies. Understanding the elements of change and adaptation is central to navigating the future. Science and indigenous knowledge are our most helpful guides. Scientific research and evidence-based policies are critical to our resilience. Science education and environmental literacy are just as important. Our children are our future citizens and leaders; they must understand how our Earth is changing and help define a culture that can successfully support life in a transformed world. To do that they will need to discern political opportunism from sound science. Science is under assault. In the Trump administration, science, health, clean air and water, and climate change are perceived as enemies to be eliminated. To head the Environmental Protection Agency, President Trump selected Oklahoma Attorney General Scott Pruitt, a climate-change skeptic who is fiercely dismantling the agency. The EPA was created by President Richard Nixon to protect human health and the environment — air, water and land. Pruitt last month rejected a petition that asked the EPA to ban all uses of chlorpyrifos. This insecticide is banned in most household settings because of its danger to humans, but is still widely used on farms for about 50 different crops. The EPA, after investigation by a scientific panel of chemical safety experts, had decided the chemical should be also banned on farms. Pruitt, however, sided with Dow Chemical, arguing that research supporting the ban was inconclusive. These are the kinds of harmful, nonscience-based decisions that taint and threaten our children's future. Trump, in late March, also made his intentions toward climate change clear by signing an executive order that essentially overturns key Obama-era rules that curbed carbon emissions in the United States. The ruling also removed a moratorium on federal coal leases as well as a requirement that federal officials consider the climate change impacts when making decisions. Donald Trump is the only major world leader today to deny the science of climate change. What he fails to realize is that efforts to protect the environment can also be good for the economy. Trump is hostile toward the scientific community. The vast majority of his presidential science positions remain unfilled. His proposed budget contains deep cuts for scientific research and programs that safeguard the environment. These include, among other reductions, crippling cuts to the EPA and the elimination of the Chemical Safety Board, which investigates industrial chemical accidents, and Sea Grant, a program of the National Oceanic and Atmospheric Administration that supports ocean research. 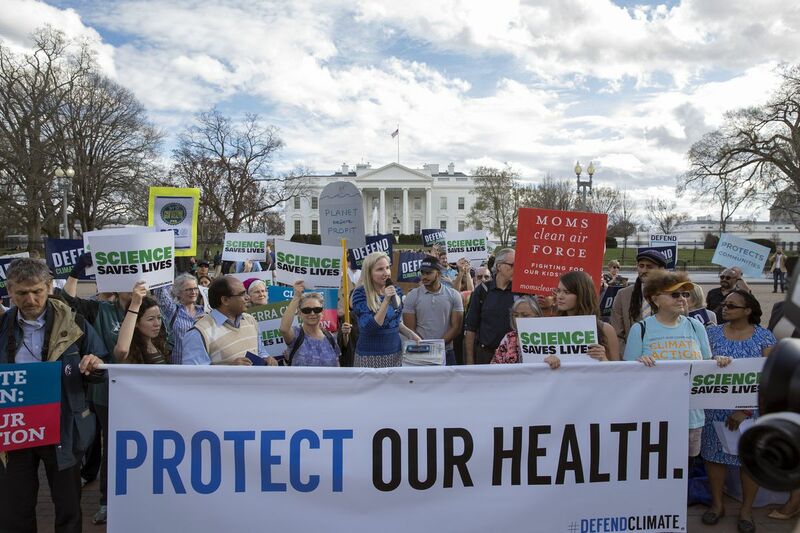 Out of concern for the future of science and the environment, science advocates conceived of a March for Science, similar to the March for Women, that rallied millions of people worldwide. Certainly, the March for Science could be viewed as part of the "Resistance" — citizens who are protesting the current administration. It is that, but it is also nonpartisan and broader than politics. The march is a reminder that science is everywhere, and science matters. Science must be supported and fostered, not marginalized for political ends. Science affects all of us and improves lives. Through the scientific process, humans express their curiosity about the world. As the leaders of the national March for Science point out, it is that inquisitiveness, combined with persistence and discipline, that is perhaps our greatest hope for the future. Join us on April 22, and raise your voices in support of science. Nine marches are planned for Alaska: in Anchorage, Fairbanks, Juneau, Seward, Tok, Dillingham, Homer, Palmer and Skagway. In Anchorage, the March for Science begins at 10 a.m. at the Delaney Park Strip and ends at the Anchorage Museum (general admission not included) where the family-friendly Earth Day celebration continues from 11 a.m. until 3 p.m. It is fitting that the Science March will lead the crowd to an Earth Day celebration. On the first Earth Day, April 22, 1970, 20 million Americans demonstrated for a healthy, sustainable environment in coast-to-coast rallies. A great deal of environmental progress followed those protests. We are once again at a dangerous point in history and once again our voices must be raised in support of science and our planet. If you're not saving the world, where are you going to live? Please join us on Saturday. Sheila Selkregg is a former member of the Anchorage Assembly and former director of planning for the Municipality of Anchorage. Sheila Selkregg is a former member of the Anchorage Assembly and former city planner.